cyclofiend: Shaking Off The Dust - Beth's "Stompy v2.0"
This blog features new additions to the Cyclofiend.com Galleries. If you want to know when the Current Classic, Singlespeed, Cyclocross or Working Bike Galleries receive updates, you can check back here, "follow" this blog by using the link below right, or subscribe to this blog's RSS feed. Most of the time, I'll highlight one of the new entries from the batches - don't take that to mean it's better or the others are worse. It's just that when I went to post those entries, one caught my attention at that time and place. This won't be my main venue for online nattering - ride reports, technical stuff and whatever tangents capture my brain will show up over on the Cyclofiend.com "Ramblings" blog, so you ought to wander over there. If you want to see what I've been writing about, there's a feed down at the bottom of this page which has the most recent posts from that blog. If you have found your way here looking for things about Rivendell Bicycle Works (rivbike.com), I am the moderator of the RBW Owner's Bunch group over on google groups. That is a discussion of Rivendell bicycles and their products, but you can learn more about that here. Shaking Off The Dust - Beth's "Stompy v2.0"
It seems appropriate to reinvigorate the updates with bicycles that share a simple design and construction. Until we decide to take the big step back to the Draisine, the singlespeed is still about as simple as you can go. And as anyone who tries it may (well...sometimes begrudgingly) admit, simple is often times good. I know that a single drive sprocket keeps calling me back - even when I might curse its inflexibility as the pitch of the climbs increase. Tonight I scooted out after a day too long rooted in front of the computer, and as the solid, windless heat lay upon the earth, the fixed drivetrain of my ride made no sound. A tangent onto some narrow trails supplied the perfect challenge to momentum and balance. Single geared bikes rock. And speaking of rocking, long time contributor to the Galleries, Beth H. has gotten a good chomp from the singlespeed bug. Her first rig of recent years was a singleated mtb which somewhere along the line I seem to have dubbed "Stompy". 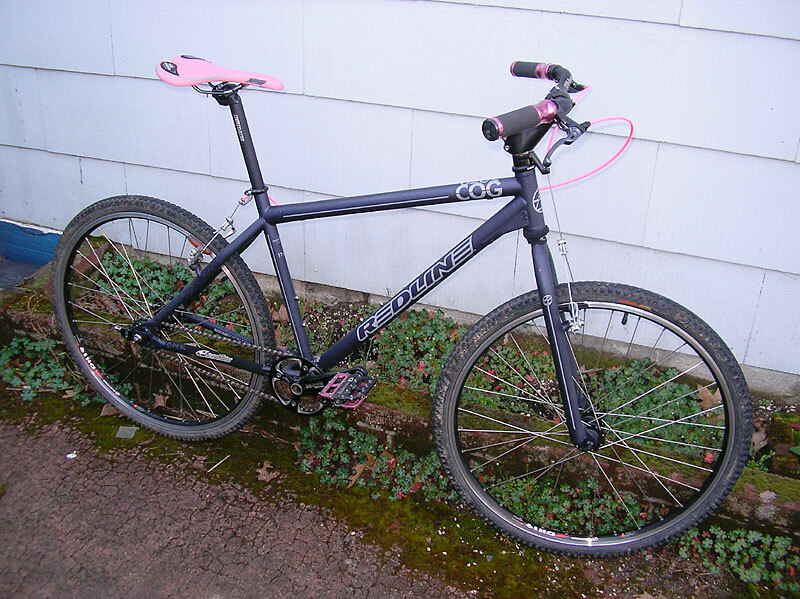 After shaking that down on the Portland short track and cyclocross scene, she has ended up with a more purpose built model, a Redline Monocog with snazzy bits of pink for accent. Cool bike! This is a Flickr badge showing public photos and videos from cyclofiend. Make your own badge here. If you click through this ad to amazon.com and make a purchase there - even if it's another item, I receive a small percentage of the sale. This is one of the ways I offset the cost and time investment of running these galleries. Please support your locally-owned businesses whenever possible, but if you are going to use Amazon, I do appreciate you following one of the links above. Thank you! The blog feed which appears below comes from my other blog - http://ramblings.cyclofiend.com - those posts tend to be a bit less Cyclofiend.com specific. Also - if you do the twitter thing, you can follow me @cyclofiend, and there's a Cyclofiend tumblr blog as well. Both of those are sampled here as well.